Trinidadians and some of the other Caribbean islanders would know of moko jumbies. These tend to be present during Carnival. A moko-jumbie needs to perfect a nimble athleticism on their stilts. Getting and remaining aloft require constantly shifting weight and attention and a graceful dismount is also a necessary skill. 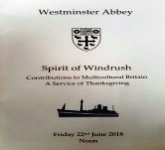 I felt the need for a moko-jumbie take on the recent ‘spirit of the windrush’ service of thanksgiving at Westminster Abbey. My favourite Carnival costume designer who has been signifying on empire, colonialism and all its newer forms, Peter Minshall, had one of costume presentations named: ‘jumbie on our backs’ (if I recall correctly). 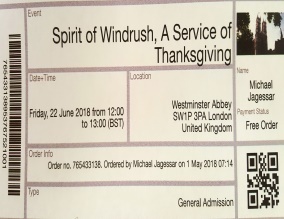 The Service of Thanksgiving at Westminster Abbey, aptly titled ‘spirit of windrush’, to mark 70 years since Empire Windrush got me think about jumbies, duppies and especially demons! Westminster Abbey reminds me of a place where jumbies and ghosts dwell. With all its history, etched ornate carvings, and wall mountings of numerous kinds and times, locate this edifice at the heart of British Empire. I could not help but sense this as a place of ghosts. I must confess, that if the Windrush Service was an attempt to help Britain continue its non-ending ritual of exorcising the nations of its colonial and empire demons, then I think we need a hell of a lot more services and a number of water tankers lined outside for the symbolic act of ritual washing or expunging place, people, and a nation of its sins. Signing up to attend the event (through ‘event brite’), who could miss the long list of instructions around arrival times and propriety around protocols? And, should you be lured into believing that you are granted permission to an event where you would have free access to move around in a worship space, think again or look closer. 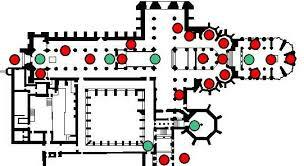 We were directed to that part of the building [see floor plan below] where you were inside but literally sitting outside of the main act of the worship space. The floor plan further gives you an idea of how distant most of us, literally blocked off by a screened or panelled area, having to depend on the TV screens located on the columns. I was waiting for ‘Johnny English’ to land from above and hoist the PM away when the protest chants would have started. That, of course, never happened! My point though is that the whole layout lent itself to marginalisation: you are in, but you are out or kept at a distance. Empire knows how to keep its dependants subservient and at arm’s length. Why the organisers felt the need to have the service in this place and that I should see it necessary to attend, offer a field day for psychologists and psychotherapists into what colonialism has done to minds! But let me be gracious and give the organisers the benefit of the doubt. It may be that their desire was to ‘signify’ on the establishment (with some of their agents present) by gathering in that space. The whole entry of some, the guests, the liturgy and ‘cultural dramatic slants’ were full of some exciting as well as surreal moments. The so-called “cultural aspects” to the ‘Spirit of Windrush” thanksgiving service must be complimented. I must say I found hope in the ‘prayers for the future’ and delight in the 2nd scripture by a very young person (Jayden Hamilton). The rest though is a disappointment. Perhaps, these were intended to remain as uncomfortable juxtapositions to what largely felt like a wholly white liturgical affair – foreign to the Caribbean experience of religiosity that I know of. The occasional clapping was more than a Black Pentecostal input to an unemotional liturgy: the clapping to specific inputs suggested what the audience really thought and felt. And while the sermon was able to name or imply events/ people and underscored the resilience and faith of the Windrush people, it was the shortest I have ever heard from a Black Evangelical Preacher. This is what Empire and the establishment do to us: they stifle our passion and tame our tongues. It is also important to note the short comments or explanation on the printed order of service. There was the one at the beginning which gave a very short synopsis of SS Empire Windrush and noting particularly that there were people from other Caribbean islands on that ship. Unfortunately, all the participants were largely people of Jamaican antecedent, down to the examples give. Then there was the other comment about the artist Terry Duffy’s creation “victim, no resurrection” [VNR] and the locating of Windrush @ 70 as station 8 on the stations of the cross (Luke 23:28) and then pointing to the cross as that which embodies sacrifice and redemption – asking us: “as we witness the presence of VNR during this service of thanksgiving may we contemplate on the lessons of hope; love for one another in responding to the call, resilience in the face of rejection, and compassion in the contributions so generously given by the brothers and sisters of MV Empire Windrush, yesterday, today and tomorrow”. One of the curious things about this comment is how the cross is deployed as a symbol of hope, with resurrection easily lending itself to both an element of fatal acceptance and serve to create amnesia in terms of the brutality of the act it depicts: death through asphyxiation preceded by being whipped, stripped naked and nailed to a cross. This continues today in more sophisticated ways! I am with the Womanist theologians who have contributed to the deconstructing of this cross-theology nonsense. How in the cross, can we find good news for those who have been sinned against remains a problem? And there is a problem with notions of redemptive suffering linked to the image of Jesus on the cross and a call to suffer for the sake of others. This was one service, while understandably about thanksgiving, should have had an element of confession somewhere during the liturgical performance. There was none though. Perhaps, the planners thought that the majority of the participants would be from the Windrush generation so such was not needed. Or it may be that they felt by naming some of the experiences would suffice. I think it was missed opportunity (with government officials present) to have had a collective act of confession. Essentially, the government was not confronted with their hostile environment policies in this celebration (a missed opportunity). One would hope, though, that the transforming power of the presence of the progeny of the Windrush generations and the peeling of those bells of the Abbey Church would be enough to soften hearts and exorcise the demons of White exceptionalism and superiority. We continue to hope and act. What will we be marking at 75 or 80?